Abraham Washington Attell (born February 22, 1884 in San Francisco, California - died February 6, 1970 in New Paltz, New York), better known in the boxingworld as Abe "The Little Hebrew" Attell, was a boxer who became known for his record-setting period as world Featherweight champion, as well as for his involvement in the Black Sox scandal and other scandals. Attell was Jewish, but he grew up in an Irish neighborhood. Because of that, he often found himself involved in fights, and according to him, he would get involved in as many as 10 bouts each day as a kid. Attell's father abandoned his family when Attell was 13, and Attell had to sell newspapers to support his family. He used to sell them on the streets and corners, and while selling newspapers, he got a chance to witness the fight between Solly Smith and George Dixon for the world's Featherweight championship. With that, Attell and two of his brothers were convinced that maybe they had a future in boxing. Attell's first fight was on August 19, 1900, when he knocked out Kid Lennett in two rounds. His mother, who strongly opposed Attell's idea of being a boxer, later became one of Attell's staunchest supporters, even betting on her son to win. He gained the nickname "The Little Hebrew" in these early fights. 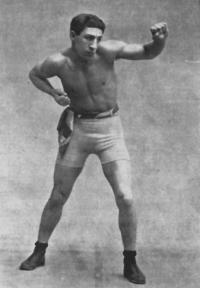 Attell won 10 fights in a row by knockout and later moved to Denver, Colorado, where he met Dixon for the world's Featherweight championship in 1903, when Attell was 18. He beat Dixon by a decision in 15 rounds, and became world Featherweight champion. He lost the crown in his second defense, being knocked out in five rounds by Tommy Sullivan. However, he regained the crown from Sullivan by beating him in their rematch by knockout. Attell then went on his streak of 18 defenses in a row (a division record until Eusebio Pedroza broke it in 1985). Attell beat, among others, Battling Nelson and Johnny Kilbane during that streak. His nicknamed changed into the "The Little Champ" during this streak. During his time as a world champion, Attell was allegedly involved with mafiosoArnold Rothstein. According to some legends, they became very good friends during this period. to make Kilbane blind. According to live witnesses, Attell also tried an assortment of other illegal methods to win the fight. On July 4, 1913, Attell accidentally hit the referee on the face during a win against Willie Beecher. He finally retired in 1917. Attell managed one boxer in his career, Marty Goldman, to a 33 Win (10 ko's), 11 Loss, 3 Draw record in 47 career fights. Attell was involved in one of sport's largest scandals of all time, when he was accused in 1920 of being the messenger between Rothstein and players of the Chicago White Soxbaseball organization, during the planning stages of the alleged fix of the 1919World Series, also known as the Black Sox scandal. Attell's name made it back to the newspaper headlines, and he along with Rothstein and many White Sox players, were formally accused of many charges, including fixing the event. All were eventually found not guilty but banned from participating in baseball activities. Attell subsequently denied being involved in any talks about fixing the series, and he alleged that the wrong Abe Attell was accused. As a consequence, Attell is, alongside Rothstein, Shoeless Joe Jackson and Pete Rose, one of the few people banned from joining the Baseball Hall of Fame. He was, however, inducted as a member of various halls of fame. Attell had a record of 92 wins, 10 losses, 18 draws and 45 no-decisions, with 51 wins by knockout, making him a member of Ring Magazine's list of fighters with 50 or more knockout wins. Attell was inducted into the original Boxing Hall of Fame. Attell was inducted into the International Boxing Hall of Fame as a member of their original class, in 1990. Attell was also inducted into the World Boxing Hall of Fame, the National Jewish Sports Hall of Fame, and the San Francisco Boxing Hall of Fame. A new pugilistic champion was made in the Vernon arena yesterday, when Johnny Kilbane of Cleveland, decisively outfought, outgamed and outpunched Abe Attell in a 20 round contest and at' the close was awarded the featherweight title by Referee Charles Eyeton. Nearly. 10,000 persons saw the fight; Fully 500-others were turned away at the gates. This was the greatest crowd that ever viewed a prize fight in Los Angeles. The receipts amounted to approximately $25,000. The men fought for a purse of $10,000, of which Attell was to receive $6,500, win lose or draw and Kilbane $3,500. They agreed to divide evenly the moving picture privilege. Attell have a lead, that was not, by any means, as decisive as that of Kilbane in the remaining rounds. Attell brought the wrath of the big crowd upon his head by foul tactics. Time and again he would hold Kilbane's arms in a clinch and once, In the' eighth, .he grabbed Kilbane's left arm with both hands and tried to bend it back. In the third he "heeled" the Cleveland boy while in a clinch and in nearly every succeeding round his work called for the hisses from the spectators. In the .seventh after rushing into a clinch to avoid Kilbaneâ€™s tattoo on the face and body, Attell butted the Clevelander with his head, opening a great gash over Kilbaneâ€™s left eye, from which blood spurted profusely. At the beginning of the sixteenth round referee Eyeton stopped the fight, grabbed a towel and thoroughly wiped off Attellâ€™s body. It was seen to covered with some greasy substance. Attell protested, but the referee paid no attention to him. Kilbane's work was a revelation to even his friends. Entering the ring with the odds 2 to 1 against him, he never faltered for an instant. He fought' fast and showed clever work with his hands and feet. A straight left jab to Attell's nose or sore left eye was his favorite blow. He would send this in, and then, like a flash cross with his right to the other side of Attell's head and jump back out of harm's way. Attell seemed wild throughout the fight, but this was due as much to Kilbane's foot work as to any other cause. Time and again the bewildered Attell' tried in vain to corner the Cleveland man. The decision of Referee Eyeton was received with cheers, and Kilbane was carried from the building on the shoulders of his friends. "I want to telephone to Mary." He said, meaning Mrs. Kilbane. Attell, tired, his face drawn and bleeding, left the ring alone. As he reached the edge of the platform, he said to a friend: "Well I had to stand for it; I couldn't do any better." Both men walked slowly to center. After sparring they clinched, and Kilbane got in a hard right to the jaw on the break. For the next minute both men stood in the center and not a blow was exchanged, then they clinched and Kilbane got In a left and a right to the jaw he was quick as lightning. They clinched again and Attell missed a right. Round even. closed the optic. It was Kilbane's round. They clinched and Kilbane complained to the referee that Attell bent his arm. Attell held on and at the break dodged a vicious left, only to encounter a hard right Each man was fighting rapidly and roughly. In the next clinch Attell was warned for heeling. Kilbane put right and left to the face. The bell rang with the men clinched. Kilbane's round. They came to the center slowly and Kilbane jabbed Attell twice.Attell tried to clinch but ran into a hard right. The boyâ€™s clinched and wrestled about the ring. Kilbane was landing three blows to Attellâ€™s one. The crowd â€œbooedâ€� at Attell for holding in a clinch.Attell backing away, motioned for Kilbane to come on, to which the Clevelander responded with a stiff left to the jaw. Round even. Attelâ€™s left eye was swollen and nearly closed and Kilbane kept pecking at it.Attell continually clinched and held on. The spectators yelled to him to fight. Kilbane backed off still hammering at Attellâ€™s sore eye and the round ended with the lads in a clinch.Kilbane showed more speed on his feet than Attell. Abe Lands First Hard One. Kilbane twice jabbed Attell's bad eye, He then rushed, but was stopped by a stiff left to the mouth. Attell's first hard blow. They then exchanged long, arm Jabs. Kilbane rushed and received a hard left to the jaw. The balance of the round was one long clinch with Honors even. Attell forced the fighting. He put a left to the jaw and Kilbane, backing away, retaliated with left and right to the face. Kilbane nearly upset the champion with a straight left to the jaw. Kilbane backed away and Attell followed, putting a good left to the wind. In a. clinch and with one arm free, they exchanged blows. At the bell each was smiling.Attell had a shade the better. against the ropes smiling. Kilbane dashed in, put the left and right to the head and then left and another right, starting the blood flowing afresh from Attellâ€™s mouth. Attell seemed tired. His face was stolen while the Cleveland boy bore not a mark. In a clinch Attell got Kilbane's chin under his head and sent the Ohio boy back. Kilbane suddenly jumped back and: staggered the champion with a terrific left on the jaw. Kilbane's round. After fiddling in the center they clinched and Kilbane put a left to the wind. He seemed much faster than the champion in the clinches. After they broke, Attell rushed .and tried hard to land on the wind, but failed. Then head to head, the lads fought for the wind, the challenger having a shade the better of it. Kilbane's round. Both rushed, and Attell got a bad left to the mouth. Kilbane then put. a right to the ribs. Abe was wild. In a clinch, Kilbane landed 'four rights in quick succession to the jaw without receiving a return The champion clinched and was hissed for holding and butting1. Then much to the amusement of the crowd Attell complained to Referee Eyeton that Kilbane was holding his arm. Kilbane's round by a big margin.The Clevelander seemed much fresher of the two. Attell led for the ribs and landed his left to wind. Each appeared to slow down. Attell landed right on jaw. In a clinch. Kilbane on ribs. Honors even. The spectators yelled "Kilbane." They .clinched and the referee had hard work separating them. Kilbane landed a left on the jaw at the break. Attell was wild in his leads. Kilbane ran into a hard right to the jaw, but countered with left and right to the ribs. Round even. Attell in a clinch, put a hard right to the jaw. Kilbane pushed Attell nearly through the ropes. Kilbane landed a vicious left on the jaw. His speed seemed to worry Attell. Kilbane landed left and right on the face. Bell rang as they were exchanging body punches. Kilbane's round. Kilbane seemed to force the fighting. He landed a hard left on the nose and the champion winced and then clinched, wrestling the Clevelander around the ring. An exchange of long jabs followed and then in a clinch Kilbane brought a roar from the spectators by imitating the "Texas Tommy." around the referee. He then let go left and right to the face. It was Kilbane's round with Attell apparently tired. Attell showed a burst of his old-time speed by getting out of a bad hole, but an instant later Kilbane put two lefts to the sore eye. As they clinched a spectator yelled to Attell that his face was greasy. "Well, it's coining out of me; I'm a Jew," smilingly retorted the champion. - As they broke, Kilbane rocked Abe's, head with a left and then landed his right on the ribs. Kilbane's round. Kilbane rushed and began a tattoo on the face. Referee Eyeton here dragged Attell and motioned Kilbane to his corner. Taking a towel, the referee rubbed 'the grease from Attell's body. Kilbane again rushed, ducked an uppercut. and landed left to the jaw. Then with a right he rocked Attell's head. Head to head, Kilbane rained blow after blow on Attell's body. As they clinched Attell' butted Kilbane over the eye, making him bleed profusely. The spectators jumped to their feet and began hissing both Attell and Referee Eyeton. -Kilbane's round. Both men rushed and fought furiously. Attell complained of Kilbane's. holding but was himself warned not to use his head again. In a clinch, Johnny got in three Blows to one from his opponent. Abe seemed to realize that he must make a strong finish and rushed, but was met every time with straight lefts. Kilbane clearly outboxed the champion. At close quarters. Kilbane nearly started the champion from his feet with -a right to the stomach. Kilbane's round. It was clinch and break with neither.lad doing any damage. After a minute of this kind of work, Kilbane rocked Attell's head with a straight left. Attell missed twice and jumped 'into a clinch. He was tired and looked worried. The round ended with. both in a clinch, but doing no damage. Round even. They were wary,. Kilbane leading first. He then backed into his own corner and when Attell rushed he dodged a.right and sent a stinging left to Abeâ€™s ribs. The spectators now were yelling wildly, for Kilbane. .Attell jumped, to a clinch and was pushed half way across the ring. As they broke Kilbane landed his left on the head and the champion looked more worried. They clinched and-Referee-Eyeton, in trying to break them, got Kilbane's left fist on his jaw. Kilbane's round. weakening. They were in a clinch when the gong sounded. Referee Eyeton pulled them apart and declared Kilbane the winner. IN a spectacular battle of fifteen rounds in which there was not a dull moment and during which the spectators were often brought to their feet with the thrill of excitement such as is only experienced at a boxing contest. Abe Attell and Battling Nelson fought what the writer considered a good draw, and the contest was so decided. The contest was one of that order that Calls forth the best that is in both men and each being the extreme of his style of milling the spectators had ample opportunity to witness both men in a wonderfully fast battle striving for first place, one with all the cleverness the game allows and the other with grim determination, courage a plenty and an aggressiveness such as has seldom if ever been seen in a light-weight pugilist. True to his word, Attell did this very thing and In the early rounds of the contest he not only out-boxed the Dane, but also out-slugged him. The weight and strength of the light-weight told on the game little fellow, however, and near the end of the contest he was forced to stall to some extent. friends that he never had before. Had the contest of last night been decided on the principles by which amateur contests are decided Attell would have been entitled to the decision, but in a professional contest there is no ruling where the referee can overlook the fighting qualities of a man and aggressiveness must also be given credit. To my mind Battling Nelson put up the Classiest contest of his career last night. At no time was he unnecessarily rough or at no time did he try to use his head as a battering ram, as It has been said he did in previous contests. He was Just as aggressive as ever and to his credit be it said that since Attell's amateur days there has never been a man box him in San Francisco, that was able to land straight left punches to the head that landed as often as those of Nelson did last night. From the very tap of the gong Nelson came a-running from his corner and not one minute of the contest did he waste in stalling. He led at all times for the slightest opening and was ready for a give and take spurt at any and all times. This fact is one of the things that made the decision of last night the only one practical, for while Attell certainly landed the greatest number of clean punches and in the fast mix-ups of the contest landed fully and hard and just as often as the Dane, yet at times he was forced to stall for a rest and cover for protection, while the Battler lashed out at all times, never for a moment stopping for a rest and his clean, cut work no doubt won for him many ardent admirers . The lover of the boxing game whose ideal fighter Is one who is clever and who uses all his cleverness to not only hit but to keep from being hit. Will of course be of the opinion that Attell should have been looked upon with favor by the referee, but the admirer of the rugged aggressive fighter who Keeps coming In at all times and who Is willing to take a punch to land one, will be Just as positive that his favorite should have been handed the plum, Argument as to ,who should have been proclaimed winner will go on for the next few days in all places where fighters and fight fans congregate, and it will all end the same, each lover of a style of fighting will argue that his fighter had the best of the going and good argument can be advanced by both sides. The first round of the battle opened 'with both men ready to- exchange punches Nelson, with his head lowered in his usual fashion came from his corner with a dash, but the clever Abe was not to be found and he cleverly stepped around the more aggressive boxer, making him miss and Jabbing him at the same time, much to the pleasure of the men who had backed him. The second and third rounds were the same. Attell showing all the time to advantage and causing the crowd to go wild with delight at his wonderful skill. The fourth was the first in which Nelson made a showing, and from that time on Attell at no time made him look as foolish as he did in the first three rounds. Nelson came from his corner with a rush and landed with right and left with force enough to slow the featherweight down.All during the round Nelson forced Attell to go on the defensive and with his short arm jolts had a good lead at the end. It was Nelsonâ€™s first round and it acted as a stimulation to his backers who urged him on. Abe came back in the fifth, and in the most sensational round of the battle he had a good deal the better of the going, not only out boxing the Battler, but also out fighting him. At the close of the round the crowd went wild with delight to see the little fellow toe to toe with the heavier opponent and in the fastest rally seen in a San Francisco ring in many a day have the better of it. The sixth round found Attell willing to rest, and although the battler was willing and anxious to continue in the mixing with his wonderful skill, stalled the round through and forced the Dane to be good by keeping close to him and locking arms. Was all in and he tried hard for a knockout. Attell cleverly avoided his rushes however and although Nelson had the best of the round attell showed to advantage with his clever ducking and side stepping. From this time on Nelson was entitled to a slight advantage on his aggressiveness and it was apparent that the handicap he carried in weight was telling on the lighter man. It was the opinion of the writer that Attell was saving himself, if possible, for two spurts at the end of the battle and he left his corner at the opening of the fourteenth round as if it was his intention. Nelson met him almost in his own corner and lashed out with a right to the body that landed solidly and forced Attell on the defensive again. All during the round it was noticeable that the punch had hurt and that Attell was careful not to get a return wallop to the same place. The fifteenth round was a give and take one in which first one would show and then the other.Although Attell had a shade the better of it. The contest was then declared a draw and both men left the ring with the opinion that they should have had the decision. place was well lighted and the seating was good. I am not complaining about the decision, but on points I believed I was entitled to the verdict. In the first half of the fight I had a lead by a wide margin, and in the last round I believe honors were easily mine. Nelson tried to make a whirlwind finish of it, but I fought him at his own game. I was never in danger during any stage of the contest and I finished up fresh. I showed the crowd that I could stand up and slug, and as I promised I met Nelson at his own game, notwithstanding he had several pounds the better of it in weight. I am willing to meet the Battler again, and I believe I could make a better showing next time, as I think I have learned his style.